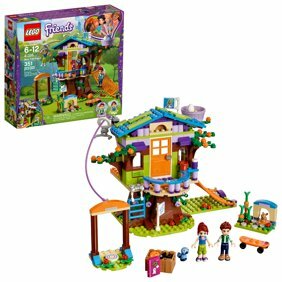 Open the door to Stephanie's Beach House with this LEGO Friends Stepahanie Beach House Play Set! Stephanie and Kate have come here for the weekend. Take Kate up to the terrace while Stephanie heads out on the windsurfer. Later, it's time to watch some TV, listen to the latest hits on the radio and prepare dinner in the kitchen. Convert the sofa into a bed and get ready for a cozy night in - and a lot more adventures tomorrow! The LEGO Friends Stepahanie Beach House Play Set includes Stephanie and Kate mini-doll figures. My granddaughter wanted this for her birthday. She just turned 10. It did not disappoint her. She was able to assemble it herself and had a great sense of accomplishment and fun playing with it. Grandma rules again!! Looks good, but not opened yet! I bought this for my granddaughter's birthday, which is July 27th, so it has not been opened yet. But she loves Legos and this should be something she will enjoy. My 8 year old enjoyed putting this together & has fun playing with it. It has some really fun features like a sail boat, bunk beds, a kitchen, bathroom & hinged roof. This is a cool beach house. It is solidly constructed and my daughter likes to play with it. The only problem with the build is that the extension on the house deck and the dock kept falling off when my daughter played with it. I modified it by removing the extension and the dock and put the blue base piece under the deck. Then the deck seemed a bit too small so I moved the first floor of the house and the stairs all the way back to the edge of the base plate. I also felt that the top floor of the house came apart from the bottom part too easily so I replaced the pink plate that the middle of the top floor rested upon with a studded piece. Sometimes I think that Lego should hire me as a designer. I purchased this Lego item for Christmas 2014, for my 7year old daughter who absolutely loves Legos. It was the lowest price when compared to Toys R Us, Target, and Amazon. I really liked the store pick up option, that way it didn't have to be shipped during the busiest time of the year, and I was sure to get it prior to Christmas Day. When you do not have a lot of money to spend, evey savings counts. this is an awesome set! I put the box with hair stuff under the stairs, and it fits perfect. it is NOT to small to paly with and the top comes off easily if u need to put someone in the kitchen. I have most of the friends sets and they couldn't be more perfect! they never never fall apart and the best thing is that they all are super cute. I love them and will always buy the friends product line. thank you LEGO for making all these awesome sets!!!!! Legos here, Legos there, Legos, Legos EVERYWHERE! I rescue pieces from the jaws of the vacuum cleaner all the time - BUT when I make her turn off the television, put away the tablet, phone and whatever device the headphones are connected to - my 11 year old 5th grader creates stunning new worlds with her Lego collections! So much so that we have begun to take pictures of her creations. Smart investment to combat the electronic device brain fog. Kids like it, I reminded them to keep the directions so they can make it again.